Napoleon Bonaparte has often been quoted as saying, "A soldier will fight long and hard for a bit of colored ribbon." 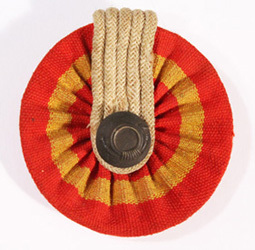 For souvenir hungry American soldiers fighting in the Spanish American War the cockade from a Spanish soldier's straw hat was just such a ribbon. As the emblem of the Spaniard's homeland, it symbolized everything for which he fought. Because of its nationalistic symbolism, and because it was small and pretty, it became one of the most prized souvenirs. Men may not have actually died to acquire one, but they certainly did die fighting for, or against, what it represented. 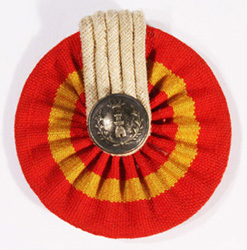 Known as an “escarapela”, a period Spanish source defined the cockade as "... a circular badge, made of folded cloth, worn on the hat as a national distinction." 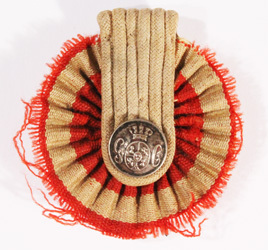 In one form or another, the cockade had been worn by Spanish soldiers since about 1700. Before the last quarter of the 19th century, it was generally solid red, the color of the ruling House of Bourbon. 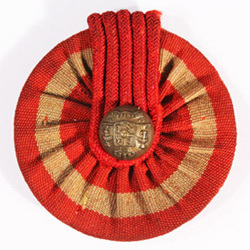 A Royal Decree of December 2, 1844 established the red cockade as the symbol of the kingdom under Queen Isabella II. In the late 1860s, political climates began to change rapidly in Spain. Isabella II abdicated in 1868 and was replaced in turn by a provisional government. They imported an Italian, Amadeo I of the House of Savoy, to be king. It was during his reign, on May 27, 1871, that the cockade changed to the colors of the national flag, red and yellow, romantically referred to by Spaniards as “sangre y oro” or blood and gold. Why the King order the change is unclear. Possibly he wanted to affirm his adopted Spanish identity, or perhaps he did not want his reign linked to the former Bourbon monarchs. In any case, the move did not meet with the complete approval of all Spaniard. Articles published in the conservative newspapers of the day strongly questioned the need to change such a long standing tradition. 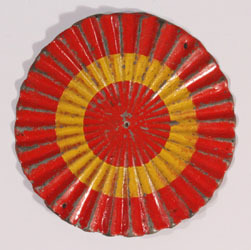 The emotion expressed in these newspapers over such a little thing as a hat badge demonstrated the symbolic importance placed on the cockade by Spanish patriots of all political factions. Amadeo's short reign was followed by the equally short lived First Republic. Finally, in 1874 the Bourbon family returned to the Spanish throne in the person of King Alfonso XII. 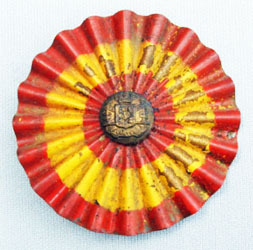 Despite the outcry from hard line monarchists, the red and yellow cockade was retained by the new king and remained in service long passed the Spanish American War. It is still proudly worn on dress headgear to this day. 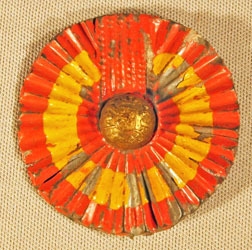 The square red cockade of a volunteer infantryman. To date, this is the only original example that has been observed. 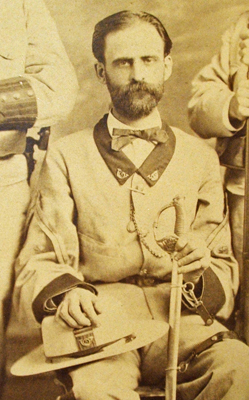 The use of a red hat badge by troops stationed in Cuba before 1871 is well documented, however, the date it was first adopted is sketchy. As early as 1851 a description of the first Civil Guard unit in Cuba refers to the shape of the cockade as "squared." 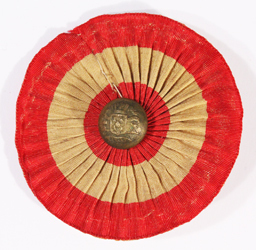 In 1855 the first uniform regulations for the newly organized Institute of Volunteers authorized a red hat insignia. The best description, however, is found in the 1861 infantry uniform regulations for Cuba. 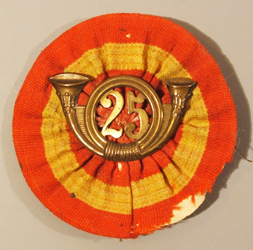 In this the cockade is described as a squared badge of merino wool divided by folds, with a brass regimental number or light infantry horn insignia worn in the center. An illustration from the 1861 Cartilla de Uniformidad for the infantry in Cuba showing the square red cockade. 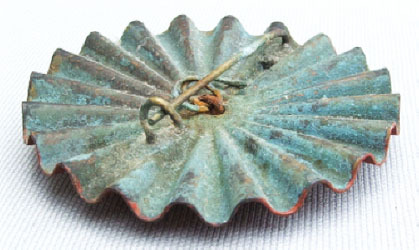 The only surviving example of an early cockade known to me closely matches this description. 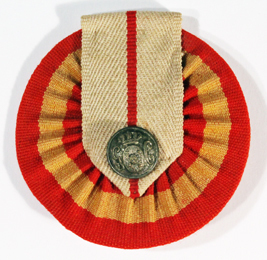 It measures 5.5 x 5 cm and is made of fine red wool with two sets of three folded welts that separate the center from the sides. 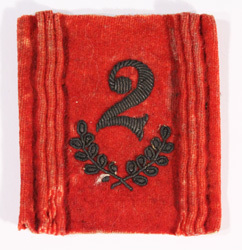 The center is embroidered with a gold bullion number "2" within a "V" shaped wreath, identify the wearer as a member of a 2nd volunteer line infantry battalion from one of the island's major cities that supported more than one volunteer unit. The reverse is stiffened with a thick paper backing. 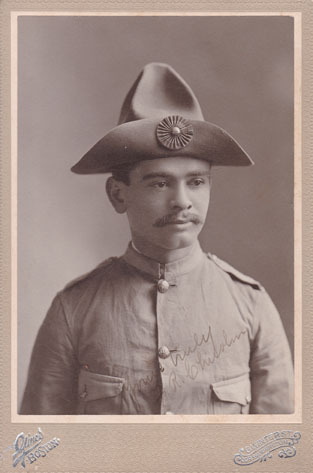 Left: 1st Lieutenant, Cazadores Voluntarios de Habana No. 5, ca. 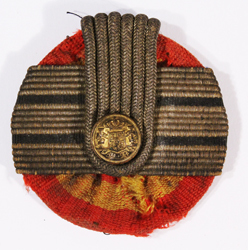 1869, displaying a square red cockade with unit insignia and rank braid (Coll: David Washburn). Right: Colorized photograph of a black militiaman dated 1862. His square red cockade is clearly visible (Coll: New York Public Library). 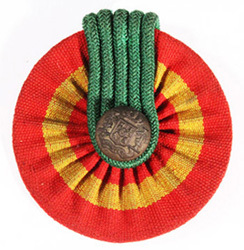 In Cuba, the new 1871 pattern round cockade displaying the red and yellow national colors is first mentioned in a directive from the Sub Inspector General of Cuban Volunteers dated January 17, 1872. 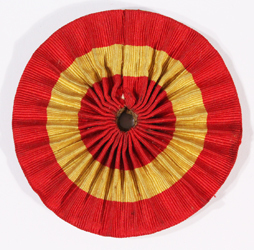 This order described the appearance of the cockade, which would remain the regulation pattern until the end of the colonial era in 1898, and codified the cord colors for both officers and enlisted men. 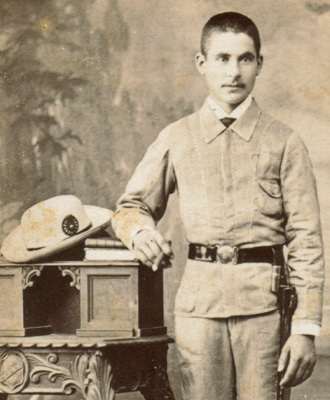 An 1890s image of a sargento primero of Cazadores with an 1871 pattern cockade. 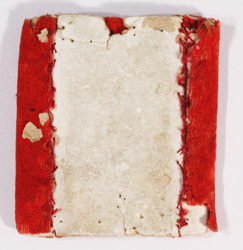 Most cockades found among the souvenirs of the Spanish American War that come with Cuban provenance match this 1872 directive. The majority are made of worsted wool tape or ribbon gathered over a pasteboard disc. They measure approximately 5.5 cm in diameter but size will vary. 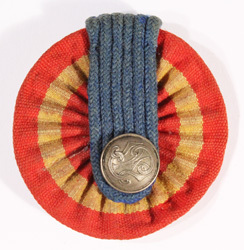 On the enlisted cockades a worsted wool cord loop, called a "presilla", looped in five or six rows with a button in the center, identified the soldier’s branch of service by color. The cord colors were red for line infantry, green for light infantry and white for cavalry and engineers. Dark blue was later added for marines. The artillery was not authorized a colored cord and button. 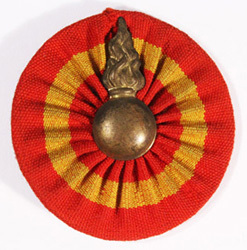 In their place a brass flaming bomb insignia was affixed. Variant cockades exist, including a “universal” pattern made without the distinguishing colored cords. 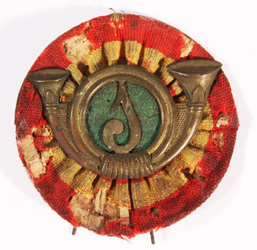 Although in defiance of the regulations, cockades will occasionally be observed with a branch of service insignia, such as a light infantry horn, in place of the button and presilla. Only the artillery was officially allowed its own insignia. An example of a non-regulation cockade from the Batallón de Cazadores "Puerto Rico" No. 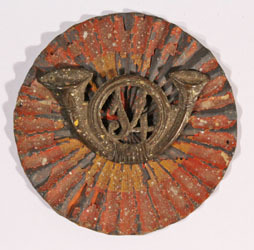 19 as worn in Cuba showing the light infantry horn and unit number in place of the presilla and button. Despite this unit's title, it never served in Puerto Rico. It arrived in Cuba directly from Spain as an expeditionary unit in October, 1895. (Coll: Sergio Rosado). Several civilian governmental department also wore cockades, including the Peones Camineros (armed road maintenance crews with police powers) as well as some other public works employees. Left: Line Infantry. Middle: Cazadores. Right: Artillery. Left: Cavalry. Middle: Engineers. Right: Marines. 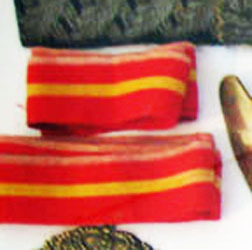 Left: Cavalry Pre-1891, also used by volunteer cavalry after 1891. Middle: Non- branch specific "universal" cockade. 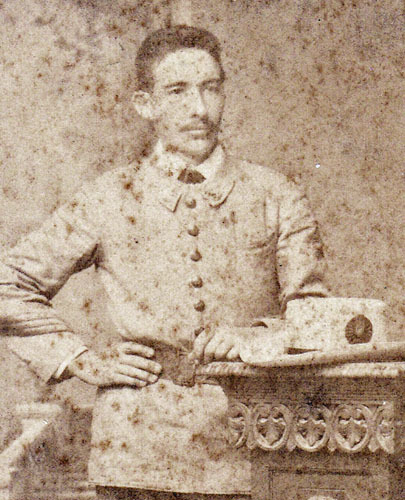 Right: Obras Públicas (Public Works) employee (Courtesy: Javier Serra Garrido-Original de Epoca). 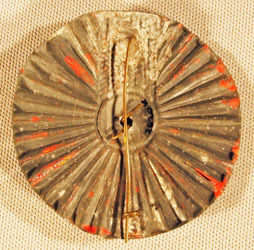 Left: The reverse of a typical cockade from Cuba showing the pasteboard disc foundation. 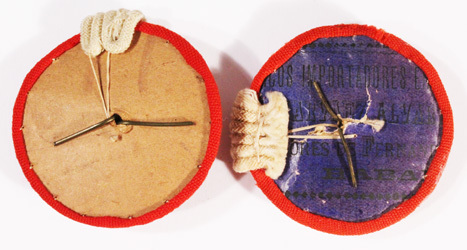 Right: Cockade made from re-cycled commercial pasteboard packaging with a label from a shop in "Habana." Two lengths of worsted wool ribbon used to make cockades. Most cockades appear to have been assembled in Cuba from materials manufactured in Spain. A detail from a display at the Museo de la Guerra Hispano Cubano Norteamericana near Santiago de Cuba. A scarce variation made of stamped brass with embossed folds and a pin back attachment. Three examples have been documented. 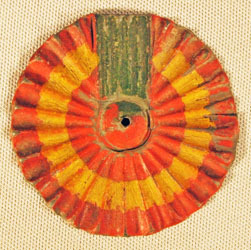 The colored finish is painted and an infantry button is place at the center. These should not be confused with the zinc cockades made in the Philippines. 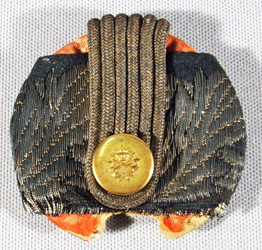 Officer's wore cockades of the same quality and construction as those of the en;istedmen. Their cords, however, were made of metallic bullion. 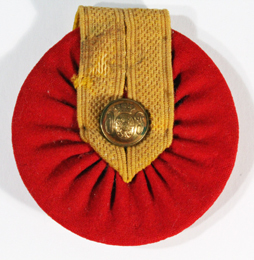 For the infantry, artillery, marine infantry and medical service they were gold toned. 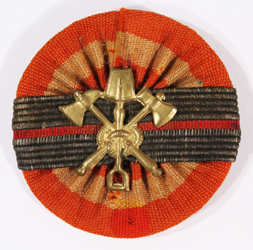 Those of the cavalry, engineers and military administration were silver in color. 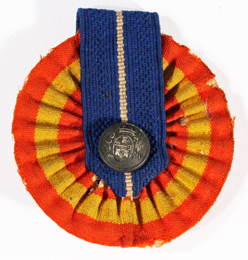 In addition, officers also displayed their rank in the form of metallic braid, the same as worn on the cuffs of their uniforms, placed horizontally across the face of the cockade. Left: Brigadier General (Coll: David Washburn). Middle: Infantry Lieutenant Colonel (Coll: Chris Magewick). Right: Infantry Captain. Left: Cavalry 1st Lieutenant. Middle: Military Administration 2nd Class Official. 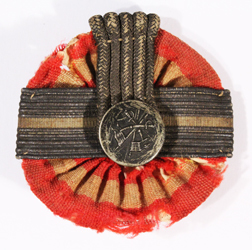 Note the serrated edge found on non-combatant branch officer's braid, a feature also found on medical officer’s rank braid. Right: Bomberos (fire fighters) 1st Lieutenant. A guardia in Cuba wearing the dark blue flannel walking-out dress uniform. His gray felt chambergo hat with cockade rests on the table next to him. Cockades of the various police organizations in Cuba differ from those of the army and volunteers in both size and construction details. 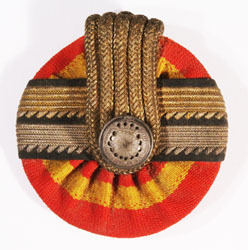 The badge is much larger than the army pattern, 7.5 cm in diameter, and is adorned with woven tape braid in place of the cord presilla. Three different police cockades from Cuba have been observed. 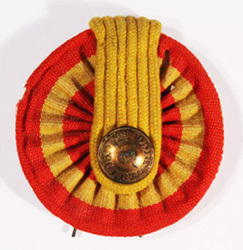 Those worn by the Guardia Civil (Civil Guard) and the Guardia Municipal de Habana (Havana Municipal Guard) were red and yellow like those of the army while those issued to the Orden Publico (Public order police) are solid red as worn before 1871. 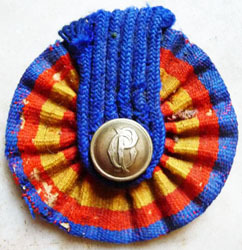 Braid retainers were white with a red center stripe for the Guardia Civil, blue with a white stripe for the Guardia Municipal, and solid yellow for the Orden Publico. All have a small hook on the back end of the braid to allow attachment to the hat’s crown. 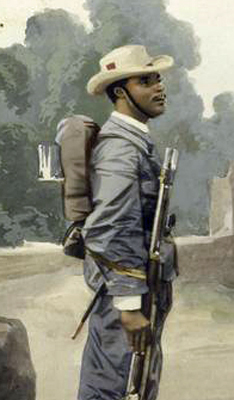 A detail of a photo of a guardia taken in Cuba in 1897. It clearly shows the method use to attach the cockade's braid to the crown of the chambergo. Left: Guardia Civil. Middle: Orden Publico. Right: Guardia Municipal de Habana. An infantryman in Puerto Rico, ca. 1885, with an 1871 pattern cockade. The history and pattern of cockades issued in Puerto Rico generally follow those of Cuba. 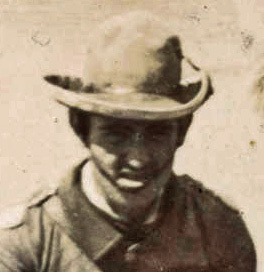 An 1860s CDV taken in San Juan has been observed showing an infantryman with a red square cockade on his hat. The Puerto Rican garrison adopted the 1871 pattern cockade at about the same it was introduced in Cuba. From artifacts observed in the souvenir record, two variations of the round National cockade can be associated with this colony. The first is identical on the obverse to the cockades most commonly issued in Cuba. However, they differ from Cuban examples on the reverse. 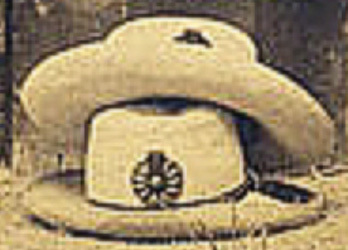 A two prong iron wire clip is attached to the back which allows the badge to be added or removed from the hat or sun helmet. 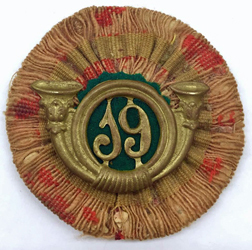 A distinctive cockade was issued to the Volunteers of Puerto Rico with a yellow cord presilla and brass button embossed “Vos DE PUERTO RICO.” Unlike the police cockades of Cuba, those issued in Puerto Rico match the standard 1871 pattern in size and construction. 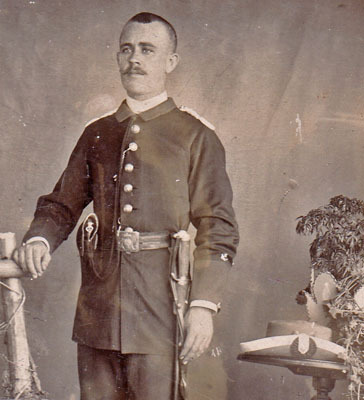 A Civil Guard example with white cord presilla and another from the Municipal Police of San Juan with a denim blue colored cord exist in the souvenir record. Left: Volunteers of Puerto Rico. 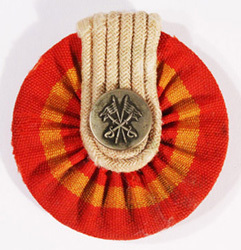 Middle: Non-regulation cockade with Cazadores insignia, Batallón de Voluntarios, Número 1 "San Juan." Right: Non-regulation cockade, Batallón de Cazadores "Patria" No. 25. (Coll: Minnesota Historical Society). Left: Guardia Civil. Right: Policia Municipal de San Juan. The reverse of three Puerto Rican cockades showing the iron wire clips. A second style associated with Puerto Rico is made of silk and found with and without a button in the center. These survive in relatively large numbers as they were issued to all the returning veterans of the 6th Massachusetts Volunteer Infantry. 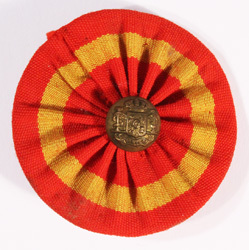 The unit history notes the following at the time of the regiment's return to Boston from Puerto Rico, "Rosettes of ribbon of the Spanish colors, held together by a Spanish infantry button, which had been presented to the men on the boat, held back the campaign hat brims from the sunburned faces of the men." These were most likely purchased in San Juan from the military goods store “El Ros de Oro” (The Golden Shako). 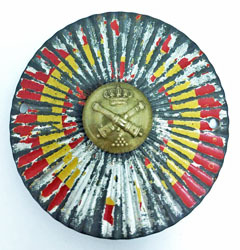 The Spanish cockade remained a badge of honor among the men of this regiment and was incorporated into much of their veteran association's iconography. 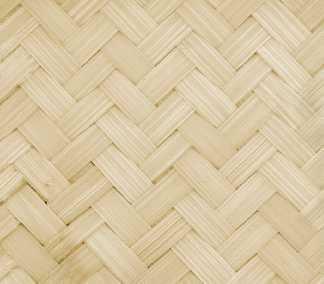 All examples of this type of cockade are found without colored cording. 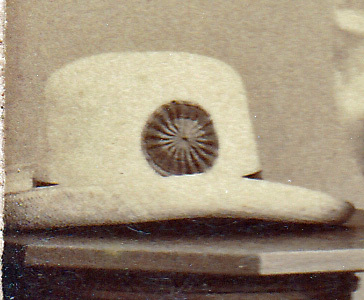 A detail of a post-1893 CDV taken in Puerto Rico showing a universal cockade without cord or button. Three “universal” cockades issued as a souvenirs to an unidentified soldier in the 6th Mass. Volunteers. The example on the left is the pattern most commonly seen. The reverse of the cockades above. Pvt. Frank R. Chisolm, Co. L, 6th Massachusetts. This unit was possibly the only integrated regiment in the US Army at the time. Company “L” was made-up of all African-American volunteers, including the officers. Pvt. 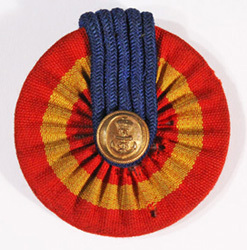 Chisolm has pinned the Spanish cockade he was issued on the transport ship before landing back in Boston to the front of his campaign hat as was the custom of the men in this regiment. 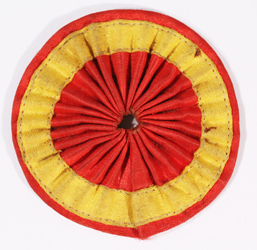 The square red wool cockade as used in Cuba does not appear to have been use in the Philippines. 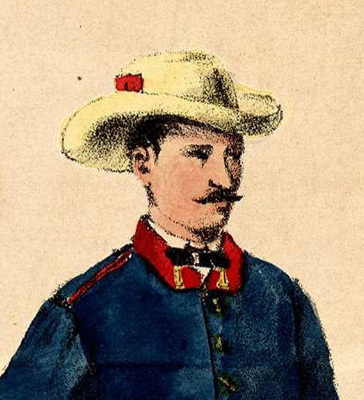 Color illustrations of uniforms worn in the Philippines published in 1855 show round red cockades with metal or colored cord retainers. 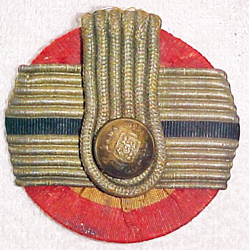 Modifications to the uniform regulations made in 1861 described the officer’s cockade with bullion cords and rank insignia. 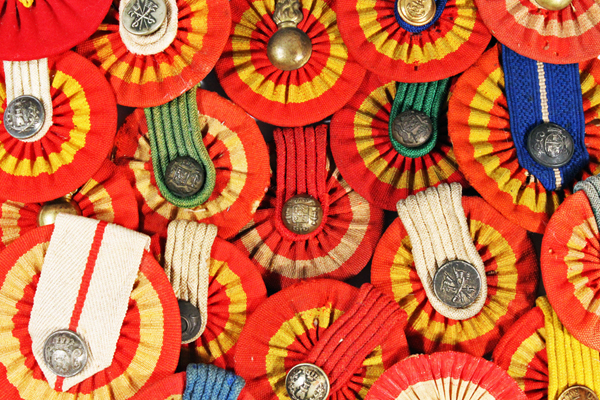 Unlike the cloth cockades issued in Cuba and Puerto Rico, the majority of 1871 pattern cockades with Philippines provenance are made of sheet zinc, stamped in a raised fan pattern and painted in the national colors. In general, they are the same size as the cloth cockades from Cuba. 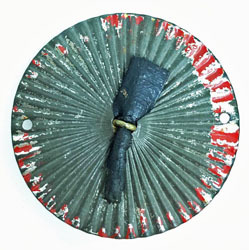 Some are embossed with false cord presillas painted in the branch of service color and a button affixed in the center. One example is known with an applied brass light infantry horn with unit number “14” identifying it to a member of the "Batallón Expedicionario de Cazadores No. 14", one of the 15 light infantry battalions raised in 1896 especially for service in the Philippines. 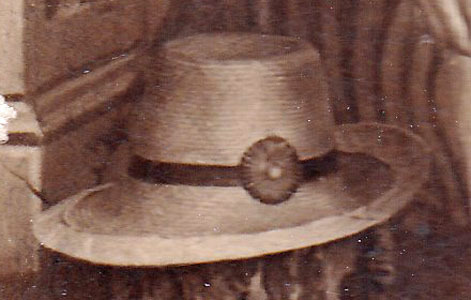 A detail image of the Philippine made metal cockade on a locally made straw hat. Stamped zinc cockades manufactured in the Philippines. 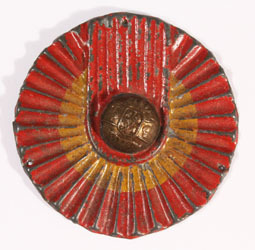 Obverse and reverse of a line infantry cockade. 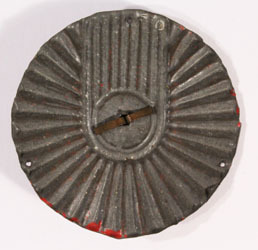 Line infantry cockade with brass pin back (Coll: Minnesota Military Museum). Left: Non-regulationa cockade with applied brass insignia of the Batallón Expedicionario de Cazadores No. 14. Middle: Cazadores (Coll: Minnesota Military Museum). Right: "Universal" pattern cockade, a souvenir of California veteran Harry H. Morris. Artillery cockade. (Coll: Sergio Rosado). Thanks to Fernando Camareno, Doug Bekke, Christopher Magewick, David Washburn and Sergio Rosado for their assistance with creating this page. All material is Copyright 2016 by William K. Combs. No portion may be used without permission.